1. Thomas du Toit of SAVE reports that they are still seeing major spills from the Parys sewage works, but through their intervention R85M has been secured from Water Affairs to upgrade this plant so hopefully there will be some improvement within the next couple of years. In addition, despite 5 court interdicts which SAVE has obtained over the past few years there are still sporadic spills from the Emfuleni waste water treatment plant. One must admire SAVE in their marathon battles with municipalities who seem incapable or unwilling to run their sewage plants correctly and ignore the adverse publicity and/or being dragged through the courts repeatedly. The Rietspruit which enters the Vaal system at Lochvaal above the Barrage is now extremely pollute with high E.Coli readings. Apparently this is the result of raw sewage and waste water entering this river in the Sebokeng area where new housing is either not connected to the Emfuleni sewage plant or the waste water system is faulty. The authorities including the DWA are aware of the situation but there does not appear to be any hope of the problem being resolved in the short term. 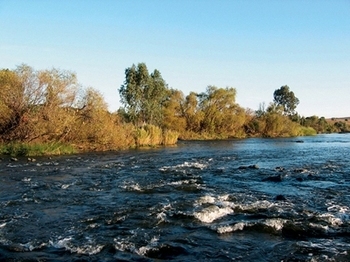 The result is that the Vaal is badly polluted below the Barrage with very poor water clarity. The writer noted that there were only catfish in the wetland pans which form part of the Marievale bird sanctuary near Nigel whereas 30 years ago there were large shoals at this Ramsar site. Mariette explained that the reason for this loss is that the DWS is currently pumping more than 100 million litres per day of acid mine water, containing a broad spectrum of metals in toxic concentrations including radioactive metals, from the Eastern Basin, neutralising the water (a pH adjustment - the water is therefore no longer acidic but alkaline; the metals have not disappeared but simply changed into a different oxidation state; the metals can again be mobilised and solubilized if the water becomes acidic) and discharges the same amount into the Blesbokspruit. The water quality results which I have received in response to a PAIA request, show sulphate levels of between 1 000 and 2 000 mg/l. The regulatory standard is 600mg/l for the Vaal River Catchment. The neutralised water is therefore unfit for any use. The metal sludge from the neutralisation process is then pumped into the old Grootvlei Shaft.